Toyota has recalled more than 1.7 million cars in Europe this year to address safety concerns. TOKYO (Bloomberg) -- Toyota Motor Corp. forecasts profit will more than double to a five-year high as it shakes off last year's natural disasters and introduces new models to regain market share. Net income may increase to 760 billion yen ($9.5 billion) in the 12 months ending March 2013, from 283.6 billion yen a year earlier, the automaker said in a statement today. That compares with the 817.7 billion yen average of 21 analyst estimates compiled by Bloomberg. The carmaker expects sales to rise 18 percent to 22 trillion yen this year. The forecast indicates Toyota may earn more profit than General Motors Co. as Akio Toyoda, grandson of the founder, rolls out new Prius hybrids, Corolla compacts and Lexus sedans to regain lost ground in what may be his first crisis-free year since becoming president in 2009. While production has returned to normal, Toyoda now faces a reborn GM that's No. 1 in global sales, a rising Hyundai Motor Co. and a growing Volkswagen Group that's dominating luxury-car sales in China. "U.S. sales are going to be the biggest cash cow for Toyota this year," said Koji Endo, an auto analyst at Advanced Research Japan in Tokyo. "The U.S. economy has been fairly good." 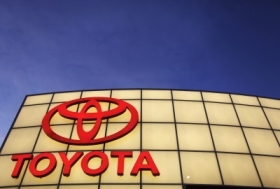 Net income in the three months ended March rose to 121 billion yen, compared with analysts' estimates for 140.1 billion yen, as Toyota cranked up production 36 percent and led the recovery of Japan's automotive industry. The yen, which appreciated and eroded the value of Japanese exports in 2010 and 2011, has reversed course by becoming one of the worst-performing major currencies during 2012. Still, Toyota's fourth-quarter rebound wasn't enough to keep full-year income from tumbling 31 percent to 283.6 billion yen as the March 11 Japanese disaster and subsequent floods in Thailand crippled automotive output. Toyota wasn't alone as Tokyo-based Honda last month reported annual profit fell 60 percent and Yokohama, Japan-based Nissan, which reports May 11, has said since February that net income would slide 7.9 percent in the year ended March 2012. Toyota's projections indicate it will earn more than GM, which last week reported net income fell 61 percent to $1.32 billion on losses and restructuring costs in Europe. Analysts estimate it will earn $7.38 billion over the next four quarters, excluding preferred dividends, which last year totaled $1.61 billion. After ceding its title as the world's largest automaker to GM in 2011, not much is going wrong for Toyota in its two biggest markets this year. Pent-up demand and government subsidies, which last until January, have helped Japan grow faster than any other major auto market this year. Passenger-vehicle sales in the country have jumped 57 percent during the first four months of 2012, led by Toyota's Prius hybrids, according to the Japan Automobile Dealers Association. That has benefited Toyota, which produces about two out of five vehicles sold in the country and generated the bulk of its revenue from Japan last year. In the U.S., Toyota's second-biggest market by revenue, the company's deliveries have increased 12 percent this year -- outpacing GM, Ford Motor Co., Nissan and Honda -- led by sales of the Camry sedan and the Prius hybrids, as buyers who put off purchases returned to dealerships to find more fuel-efficient models. Total U.S. light-vehicle sales, which rose to a seasonally adjusted annual rate of 14.4 million in April, have exceeded analysts' estimates three out of four months this year. In Europe and China, where auto sales fell during the first quarter, Toyota has been less vulnerable to slumping demand because it is less reliant on those markets than companies such as PSA/Peugeot-Citroen and GM. Toyota, which had a global market share of about 10 percent in 2011, accounted for 3.2 percent of Europe's market and 4.3 percent in China, according to data compiled by Bloomberg. Toyota sold 82,000 units in China during April, a 68 percent increase from a year earlier, according to Beijing-based spokesman Niu Yu. The carmaker was suffering from production disruptions from the March 11 earthquake in Japan last year. GM, the largest foreign automaker in China, increased sales in the country by 12 percent from a year earlier to 227,217 units last month, as demand for its Wuling minivans offset a drop in Chevrolet deliveries. By volume, the maker of Corolla and Camry sedans said in February that deliveries -- including those of its Daihatsu Motor Co. and Hino Motors Ltd. units -- will increase 21 percent to a record 9.58 million vehicles in the regular calendar year. That would be more than last year's sales by GM, which hasn't given a forecast for 2012. Toyota built 46 percent of its cars in Japan in the year ended March, making it more vulnerable to a stronger yen than its nearest rivals. Nissan Motor Co., Japan's second-biggest carmaker, built 25 percent of its vehicles in Japan last fiscal year, while Honda Motor Co. produced 28 percent of its cars at home.